Questions about e-filing sealed documents? First, review the Court's Guide to Electronically Filing Under-Seal Documents in Civil Cases. If you still have questions, contact the Help Desk at 213-894-0242 or ecf-helpdesk@cacd.uscourts.gov. Effective December 1, 2015, the Court's Local Rules regarding the filing of sealed documents in civil cases were significantly amended. Unless the entire case is under seal, attorneys are now required to file all sealed documents and applications for leave to file under seal electronically in civil cases. Before e-filing any documents under seal, or any applications for leave to file documents under seal, please review Local Rules 79-5, 79-6, and 79-7. Detailed guidance and step-by-step instructions for electronically filing sealed documents and applications for leave to file under seal are set forth in the Court's Guide to Electronically Filing Under-Seal Documents in Civil Cases. Local Rule 79-5.2 requires that e-filers familiarize themselves with this Guide, and provides that failure to comply with the instructions in the Guide may result in the disclosure of confidential information. In addition, a quick overview of the steps required to electronically file under seal documents that have been designated as confidential pursuant to a protective order is attached here. 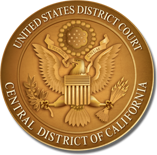 If you believe you have e-filed a document incorrectly, resulting in a confidential document being publicly filed, please contact both the Court Room Deputy and the Help Desk (213-894-0242 or ecf-helpdesk@cacd.uscourts.gov), explaining the error. Then, if you have not already done so, e-file an Application for Leave to File Under Seal pursuant to Local Rule 79-5.2.2. Note that pro se litigants who have been granted permission to file documents electronically in a particular case must continue to file sealed documents, and applications for leave to file under seal, in paper form. The CM/ECF System does not permit pro se e-filers to file documents under seal at this time.